Want to get iMessage on a PC? You’re not alone, because iMessage is the wonderful messaging platform for iPhone, iPad, and Mac users that allows for free and easy messaging between other iMessage users. Not surprising then that one common question regarding iMessage is if there is a way to run iMessage on a Windows PC. The answer is a big complicated, but in short, yes you can get iMessages on a PC from a technical standpoint, but how it is accomplished is probably not quite what you expect. Read on to learn how to get access to iMessage on a PC with Windows or even Linux. For this to work, you will need a Mac. Yes, even if you’re aiming to get and use iMessages on the PC itself. The basics of how this approach works to gain access to iMessage on Windows or a Linux PC is as as so: first, you enable Screen Sharing remote control on the Mac with iMessage. Then, on the Windows PC you want to access and get iMessages on, you screen share into that aforementioned Mac and connect to it, giving access to the iMessage app and other stuff on the Mac. That might sound complicated but it is actually pretty easy to setup. Is this the only way to get iMessage on PC for Windows or Linux? For the time being, yes, using screen sharing is the way to get iMessage on a PC. This is very much a workaround, but it does work to send, receive, and have complete iMessage functionality from a Windows or Linux environment, as long as you have a Mac to begin with. Can’t you download iMessage on PC? While you can download iCloud for Windows PC, iCloud for Windows does not bring iMessage to Windows. This may be obvious to most Apple users, but there is no native iMessage client for Windows (or Android for that matter), as Apple allows iMessage communication only in Apple products like a Mac, iPhone, iPad, Apple Watch, or iPod touch. 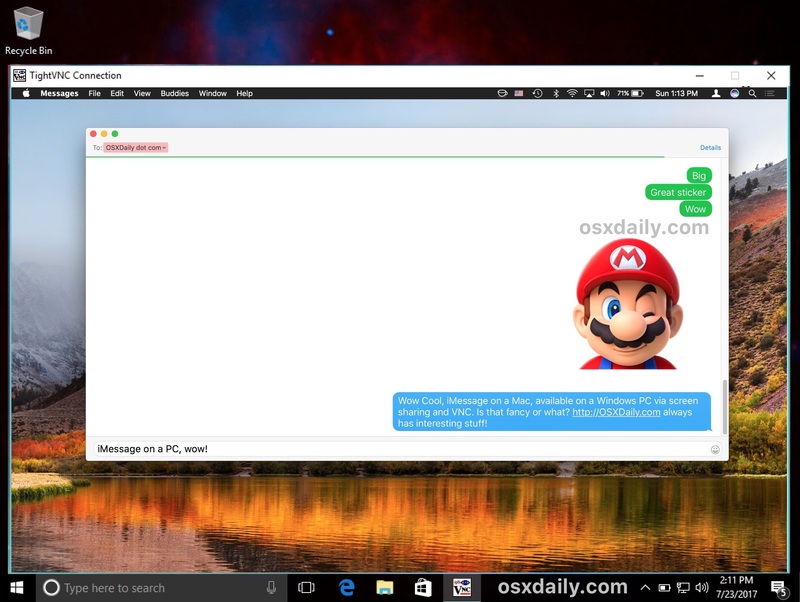 What about iMessage on PC with Google Chrome Remote Desktop? Another option to get iMessage on PC is to use Google Chrome Remote Desktop plugin, but this is simply another variation on screen sharing which we covered above. To use iMessage on PC with Chrome Remote Desktop, you will still need a Mac with iMessage configured and with Chrome Remote Desktop enabled and open. Once that is setup then you can connect to the Mac with iMessage through a PC (Windows or Linux or Chromebook) with the Chrome browser and Chrome Remote Desktop. Anyone can download Chrome Remote Desktop free from Google here if they are interested in that approach. Are there other ways to get iMessage on PC? So what works to get iMessage on a PC? The approaches discussed above are it! That might sound disappointing, but that’s the way it is for now. So the answer resides with having a Mac with a stable internet connection that is logged into the iMessage account you want to use and get access to from the PC, and then using the built-in screen sharing feature in Mac OS to remotely access that computer and it’s messaging client via Windows PC (or linux). 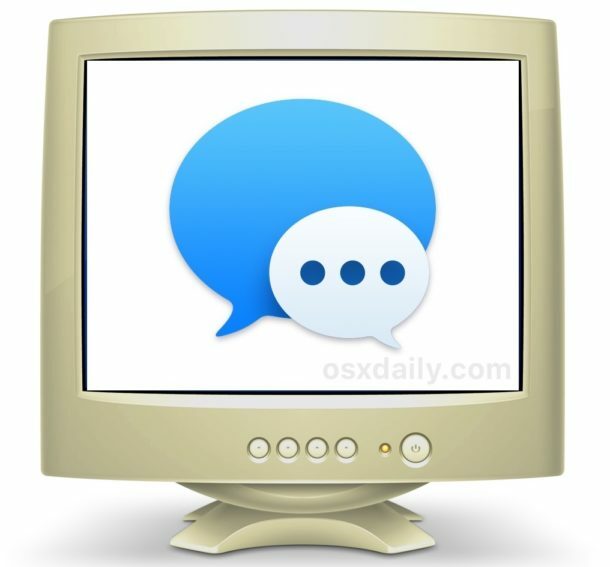 The screen sharing methods described above, using VNC and Remote Desktop or Google Remote Desktop, are the only ways to get iMessage on a PC. This is achieved by connecting to the Mac remotely from the PC as discussed. There is a unique exception… for Hackintosh PC, but it’s only available for Hackintosh, which is a PC running MacOS. That setup is complex and involves installing and running Mac OS on a PC rather than Windows or Linux, and that is beyond the scope of this article. It’s worth mentioning that it’s very difficult and complex to get iMessage working on a PC even with Mac OS installed via Hackintosh methods, thus we’re ruling out that option. Thus, aside from the screen sharing methods as described here, there are no other legitimate methods to get iMessage on PC. Unfortunately there’s plenty of baloney and shenanigans out there on the web that will try to convince you otherwise, but they do not work so don’t fall for it. It is always possible that some day Apple will support iMessage on PC natively but that has not happened yet. iMessages in iCloud is a new feature with newer system software from High Sierra and iOS 11 and later, but (currently anyway) this does not allow iMessages to be accessed from iCloud.com. An alternative to iMessage is to use another cross-platform compatible messaging client. There are various options available for this purpose, each allowing messaging, sending of text, pictures, and videos, and other features commonplace with messaging apps and services. Signal is a secure messaging platform that is available on basically every device, whether it’s Windows PC, Linux, Android, Mac, iPhone, iPad, and Signal users can send messages back and forth to one another easily. 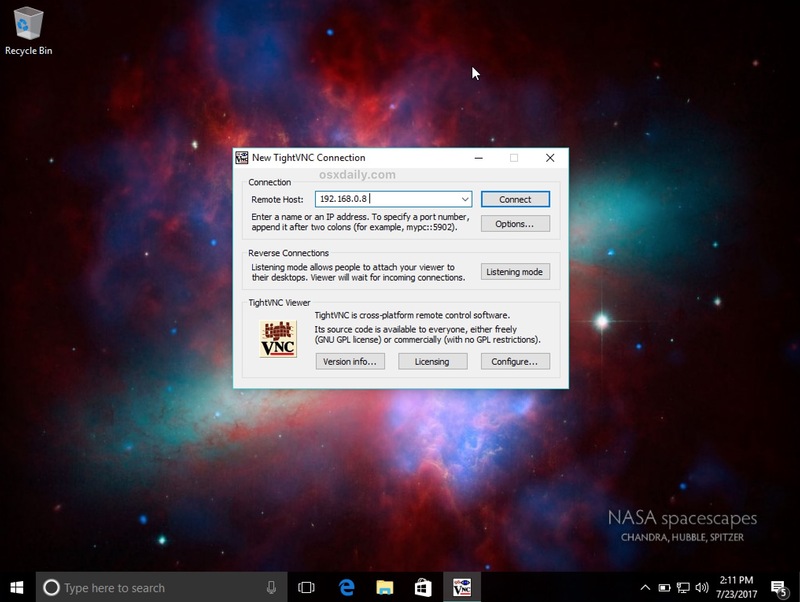 Signal is a free download and setting up Signal messenger on a computer is easy. WhatsApp is another free messaging option that is cross-platform compatible. You can learn about setting up WhatsApp on a computer here. Finally, for Android users specifically, they can try WeMessage, though the screen sharing methods above are perhaps easier to setup and use for many users. Also for messaging across platforms Facebook or WhatsApp are good. Google hangouts is popular and cross platform too. Sorry, but nope. “Remote viewing of a Mac running iMessages” might work, but it is hardly getting access to iMessages on a PC. Layer on the fact that many corporate firewalls break VNC, this is not a solution for the average Mac user. Deezy, there is no other way. But I am anxiously awaiting your solution for iMessage on PC, literally any other solution or method, any way at all to get access to iMessage on PC. Keep us updated! Telepathy maybe? I simply object to the statement as made in the headline. It’s like saying “How to run Sierra on your Windows PC” and having the solution be to use VNC on your PC to take control of the Mac you already own…. Windows users don’t deserve iMessage. I’d like Apple to address the incompatibility of iMessage and SMS. If you do not have a data connection complete compatibility with SMS just doesn’t happen. I think in here is the answer to my confusion. I use text messaging a lot on my iPhone. I don’t know, and should I care, what the recipient uses. Blackberry is used by my most constant “messager”. So what is iMessage and how is it different from what came installed on my iPhone 5c? Is it something I need? Do I buy or obtain it from App Store? Am I using something that Joe Singer calls SMS? iMessage is the proprietary Apple messaging protocol, you must have an Apple device with Apple ID to use iMessage. SMS is text message protocol used by cell phone carriers, thus you must have a cell phone connection to send an SMS. You can SMS from a Mac if you set it up, but it needs a cell phone to relay the message through since it is cellular carrier dependent. iMessage can be sent from email to email without a cell connection and only a data connection. Or… just hop on your Mac and use the app. If you are away from you Mac that is not an option but you can connect to the Mac to get to the iMessage. Makes sense to me. Do you know of another way? Umm… iPhone, iPad, or Apple Watch. Look for the follow-up article “watch HBO without cable”. … By watching through your neighbors window. I’m with Joe, but I want to add that reading about screen sharing makes me want to try it. That’ll be a new experience to add to my twenty plus years of using Macs and later, Windows based PC’s. Let me Fix The Title of this article for you. This is a cool “Hey look my overly complicated mousetrap works”, idea, but it has no practical value. I solved it on a PC with a uber powered Nvidia GPU i had for testing Deep Learning (neural networks) using CUDA. While my solution is not for the ones with slow PCs with small amounts of RAM, it did work great. I set up a Virtual Machine (VMware Workstation Pro). While running El Capitan was easy, using Facetime and Messages was not. You need to set up the VM in a ”hackish” way, to fool macOS/OS X that you are running a genuine Mac. But it went well, and I did manage to cut down the resources, by killing off almost everything unnecessary like different system services not used for this and so on, to create a ”barebones” (not really) macOS/OS X for running a few applications (i also simplified the UI, killing off the desktop and the dock, and created a launch agent to start Messages upon start. Hey that’s really cool, that might be the best way to get full iMessage access on a PC directly. Thanks for sharing Chris. I like how I’m the only one in the comments on Linux. Thats very much possible but we can still have more alternative of Imessage. If you have an Alienware or Dell laptop (The Alienware version is the same thing but Alienware branded) you can get iMessage on your Windows PC. It’s kind of a hack, but it works!